Barcelona won its fourth straight game, dropping Milano lower in the standings. 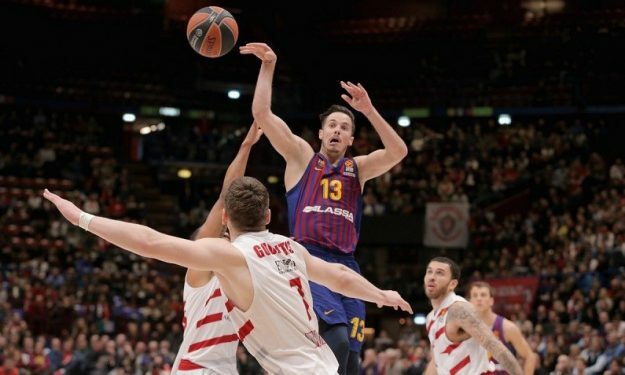 Thomas Heurtel scored a team-high 21 points and dished out six assists and Adam Hanga added 15 points, five rebounds plus some big-time two-way action in the fourth period to lead Barcelona to a 90 – 85 road win over Olimpia Milano on the road. Following a dominant second half, Barcelona went up by 12, 68 – 80 with three minutes left to play. Milano managed to make it a one-possession affair thanks to a 3-pointer by Vladimir Micov (20 points, six rebounds) with eight seconds remaining, but a pair of free throws by Heurtel and then another 2/2 by Kevin Seraphin kept the visiting squad safe. Seraphin was the second-top scorer for Barcelona with 16 points. For Milano, Mike James had a near-triple-double performance of 20 points, eight assists, and seven rebounds while Arturas Gudaitis added 16 points and seven boards. Milano was up 39 – 36 some seconds into the third period but consecutive buckets by Heurtel plus some triples courtesy of Pau Ribas put Barca up 42 – 49. Micov helped Milano approach 64 – 67 at the beginning of the final period but then Hanga took over on both ends to propel the Blaugrana towards grabbing a double-digit advantage. This loss dropped Milano to 8 – 9. There’s a three-way tie now in spots 7 to 9 with Milano, Panathinaikos and Bayern Munich.